It was the same spot he chose to park his push cart, the corner road that faced the school gate. His push cart was plain wooden one with its pale blue paint that once must have been a bright and happy shade of blue, now peeling at the edges and exposing the dark wood underneath. There was nothing fancy about his shop that earned his livelihood and there was no colourful board bearing his name or his humble shop’s name. It was a plain and boring looking little shop selling things that was far from being labelled boring things! As soon as he parked his push cart in his designated area, he took out two incense sticks tucked in the old cotton bag and lighted them with the match stick. The aroma of sandalwood mingled with the sweet smelling pile of things in his cart. He prayed to the framed old photographs of gods and goddesses with four arms and pushed the incense sticks to the gap at the corner of the cart. Once he finished prayers, he began to light the heavy iron stove brimming to the top with charcoal. The stove was old, just like him and it may as well be as old as him! It was jet black with little rusty legs from the heat and smoke of burning charcoals for few decades. As he frantically fanned the stove with the hand fan made of palm leaves, the black charcoal slowly turned amber and then hot red. Just when the little tongues of fire licked the grill placed on top the stove, he heard the school bell ring for the final time for the day. He knew within few minutes little kids from the school will come running out and queues up in front of his humble cart. He chose the very best of his produce from the little pile of mountain and began to remove its husk and silk fibres to expose the beautiful inner part studded with shiny yellow rows of pearls. Some were deep shade of cream colour and some a beautiful shade of yellows. Just when he about to husk the fibres from the fourth one, he heard the creaky noise of the large iron gates of the school being opened to little tsunami of group of children running out from their class rooms! Within a minute a large group of little kids were all shouting at the top of their voice asking for the very best of produce that he had in his cart. ‘I want more it really spicy’ said one; ‘I want the tender one’ begged the other. ‘I want it well roasted’ said the third, ‘and I want it to have more bite’, said the next one! He listened to every request and gave them the tastiest and healthy snack their mothers would have approved of wholeheartedly! 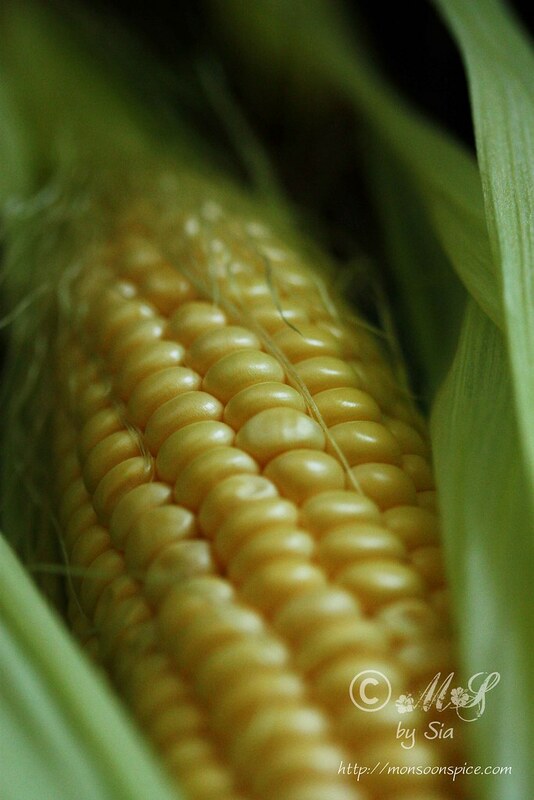 Corn on the cob ~ Before and After Roasting! He was the Bhutta-wala or Bhutta-wala (‘Bhuttah or Butta or Bhutta’ means corn on the cob and ‘wala’ means the merchant selling them) selling Bhuttas or Roasted Corns on the Cob who made everyone stop in their track and queue up, salivating at the sight of Bhuttawala rubbing the tangy lime wedge generously dipped salt and chilli powder mixture on the roasted corn! Roasted corn on the cob ~ ready to devour! The Buttawala or Buttawali were the first one to spot when the monsoon rains hit the scorching earth and brings that distinctive smell of earth. Monsoons at home is nothing like the rains here where little drops of rain drizzle gently from the sky and kiss the earth tenderly and dance to their pitter-patter music in the small puddle. The monsoons back home is when the rain is accompanied by gushing wind, howling in the dark night like a lonely wolf. Monsoons back home is the torrential rain that falls angrily on ground washing the dust from the streets, tearing the sky without mercy. 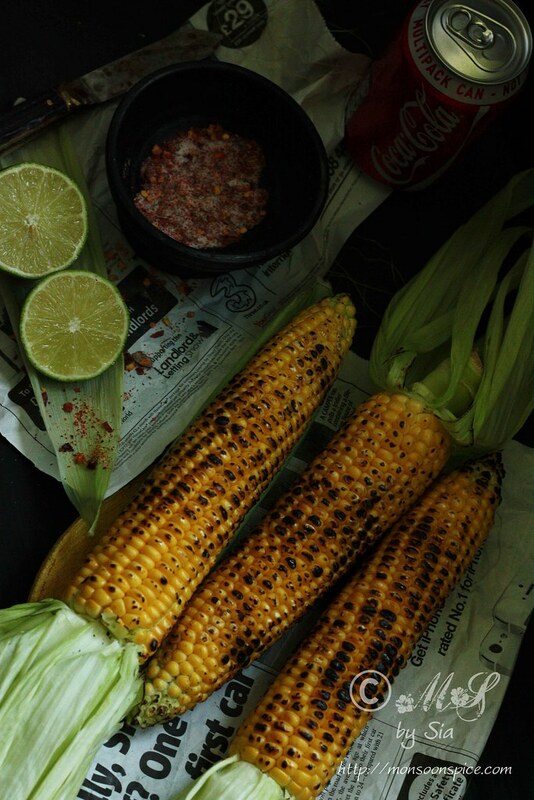 And it is the monsoon rains that bring with it my most favourite street food, Bhutta or simply the Indian Styled Roasted Corn on the Cob. 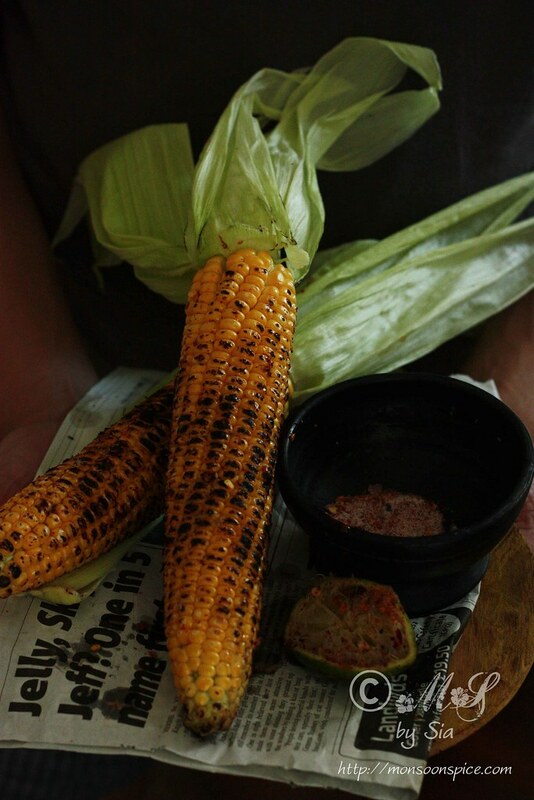 The Bhutta roasting nicely on the burning charcoal fire is a welcome sight on a rainy monsoon day and the thought of sinking your teeth into sweet corn kernels generously rubbed with lime sliced dusted with salt and chilli powder always makes me smile! It’s funny to see how most of my fond food memories are associated with most simple things like this, roasted corn on the cob! 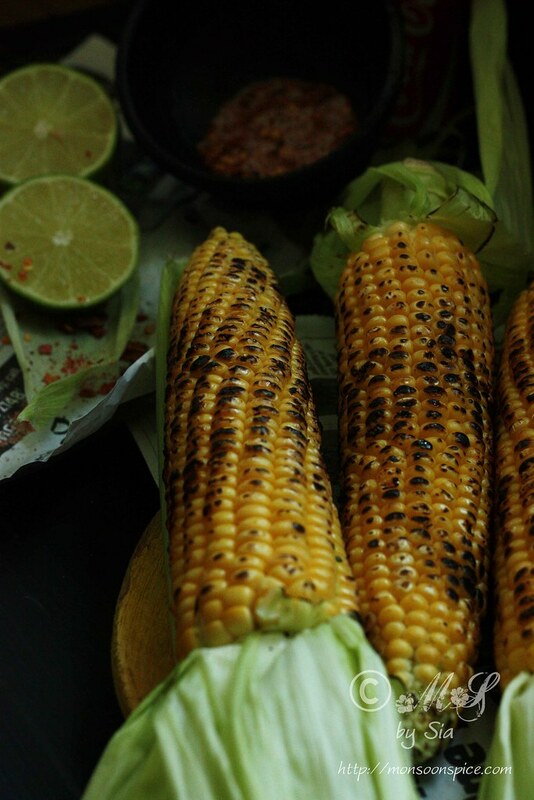 There is nothing glamorous or fancy about Bhutta, but it does have that great sense of drama when the corn on the cob is slowly roasted on a bed of red hot charcoal. Occasionally the red charcoal catches fire and the little tongues of these burning flames licks the sweet kernels with great hunger! In between the roasting you hear a sudden pop noise when few kernels which greedily plumped up bit too much under the loving touch of flame! With some kernels charred and smelling of smoke, the Bhuttawala dips the lime piece in a bowl that contains the salt and red chilli powder mixture or if you are really adventurous, in a bowl of chutney made of super spicy and potent green chillies ground with sea salt. The little swirls of smoke rising from the freshly roasted Bhutta when the Bhuttawala rubs the lime wedge is a pure magic to all senses! Magic, yes, magic is the word I would use for this humble Bhutta that never fails to live up to its high expectation of taste sensation! 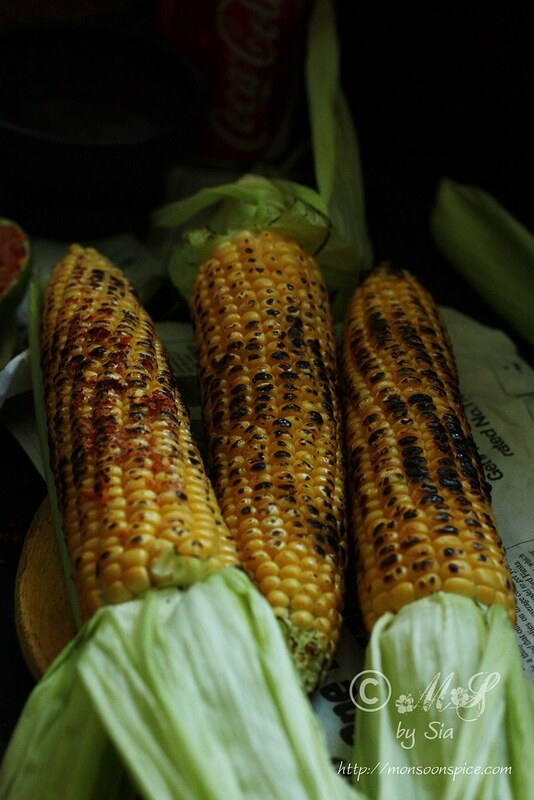 Although not as great tasting as the ones that Bhuttawala makes in his charcoal stove, you can make very satisfyingly delicious Bhutta or Indian Styled Roasted Corn on the Cob at home on the hob. This is my humble attempt at recreating the magic that I grew up eating, appreciating, and falling heads over heels in love with! 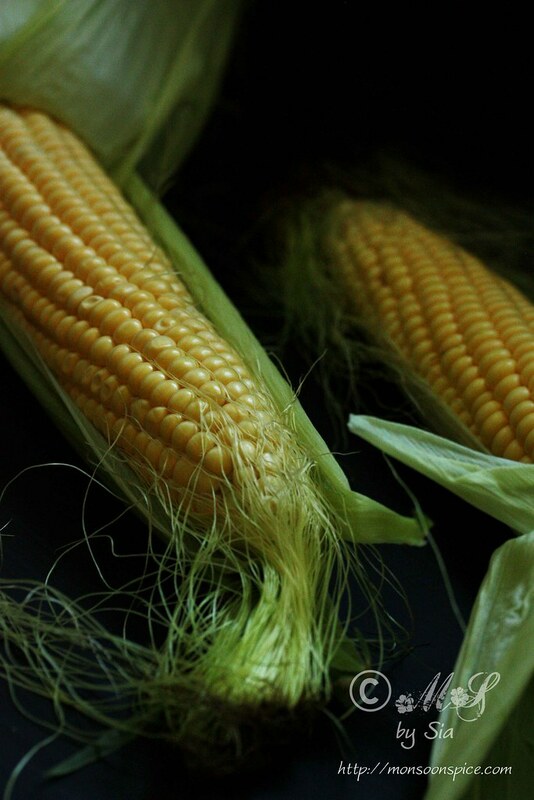 Remove the husk and silky strings from the corn cob to expose the kernels and keep it aside. 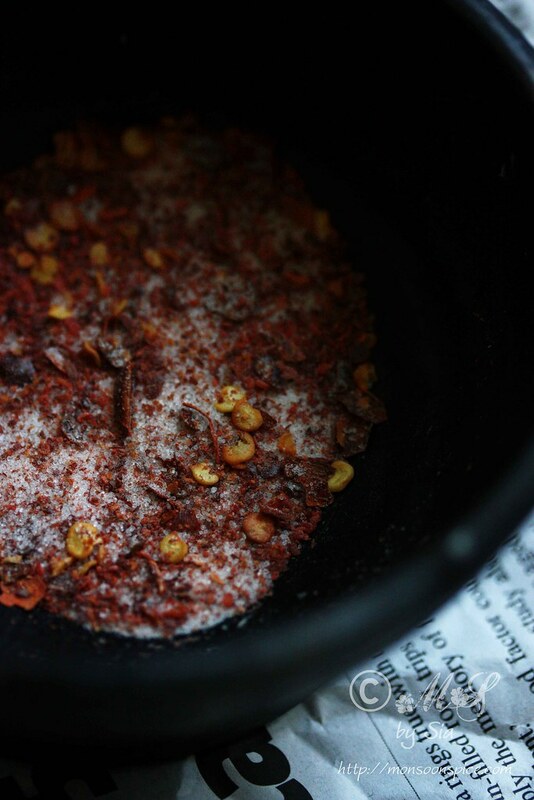 In a bowl combine the red chilli powder, chilli flakes and salt and keep it aside until needed. Slice the lime into two halves and keep it aside. Turn on the gas on hob at medium to high flame. 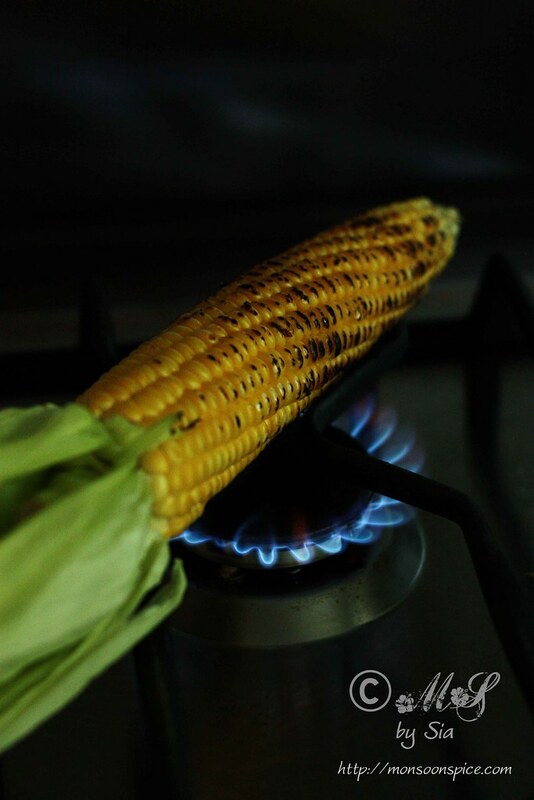 Place the corn on the cob to exposed flame and move it back and forth on the fire. Keep it rotating at every 5-10 seconds interval so all the sides are exposed to the open flame. 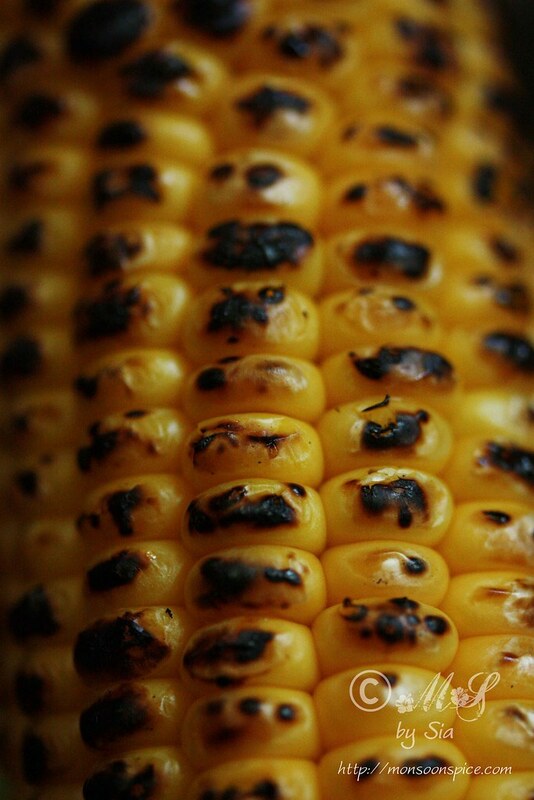 You will hear few corn kernels pop and crackle as they puff up and get roasted when exposed to open flame. Make sure that you keep moving the corn so as all the sides gets evenly roasted. 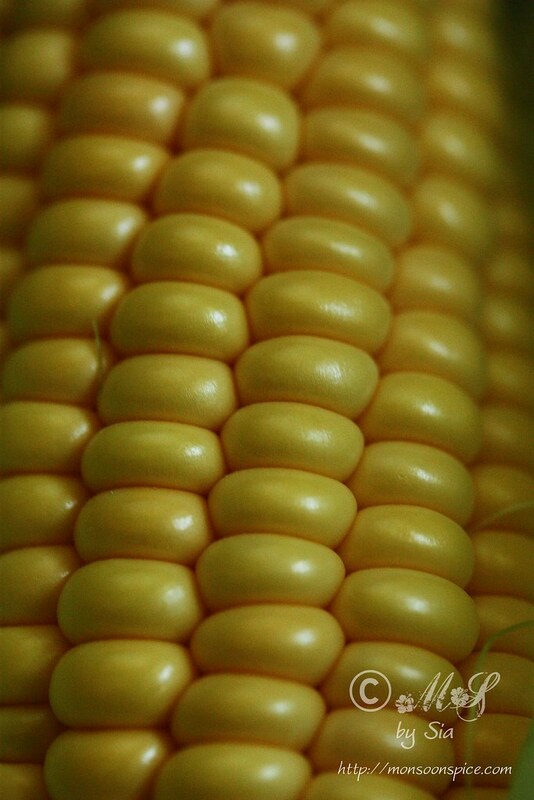 It will take around 2-3 minutes per corn to roast. 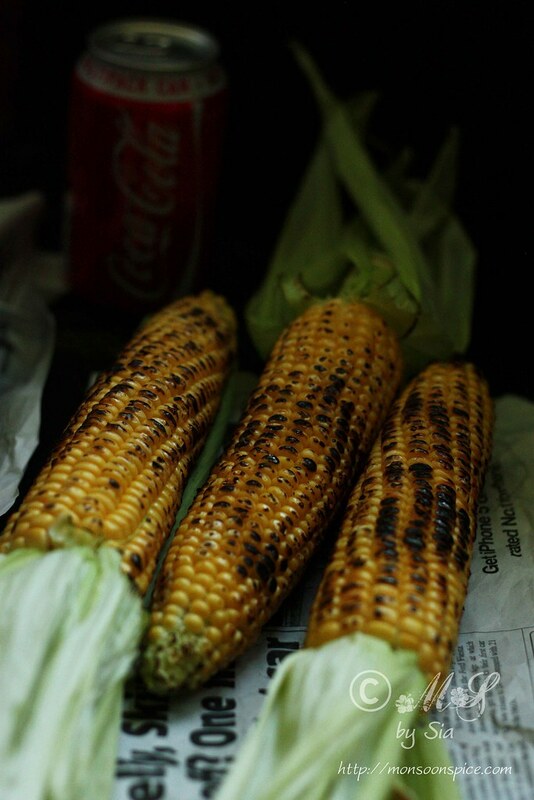 Once you see the kernels turn brown and few gets charred to black in colour, remove from the flame and set it aside. 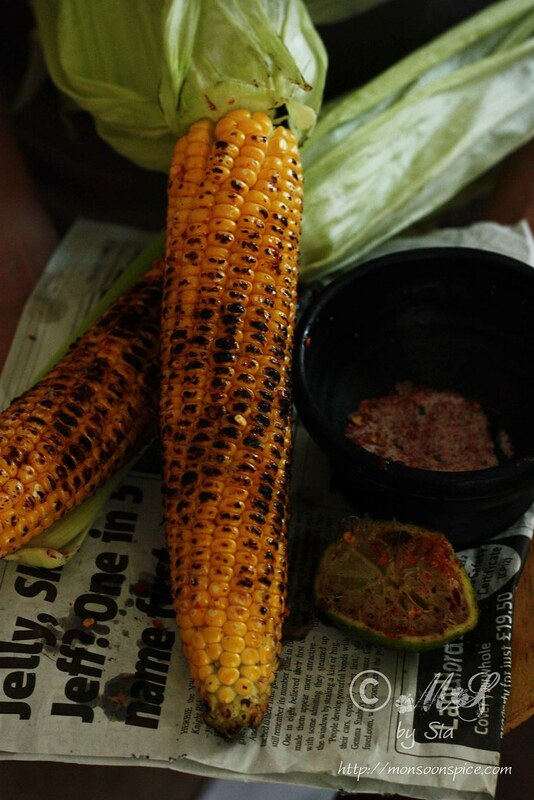 Hold this roasted corn in one hand and with other hand and the slice of lime in other hand. 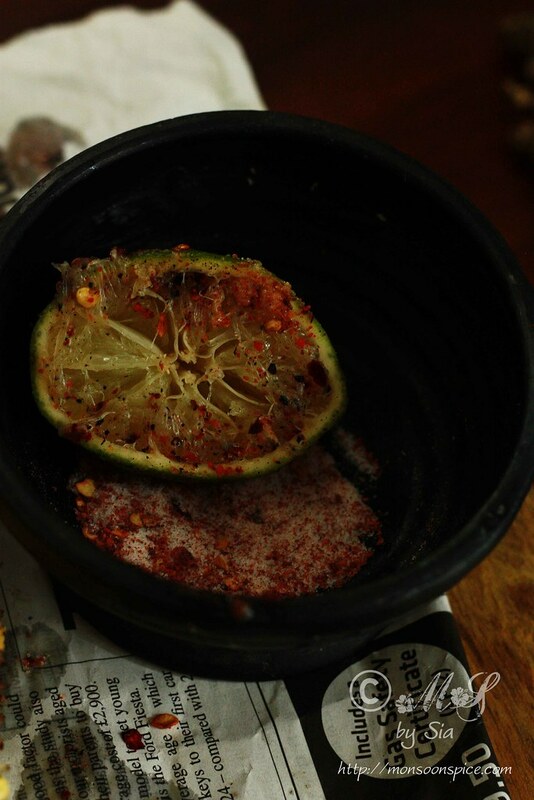 Dip the lime half in a bowl of salt and chilli powder. Make sure that you get a good amount of chilli powder on the sliced lime piece. 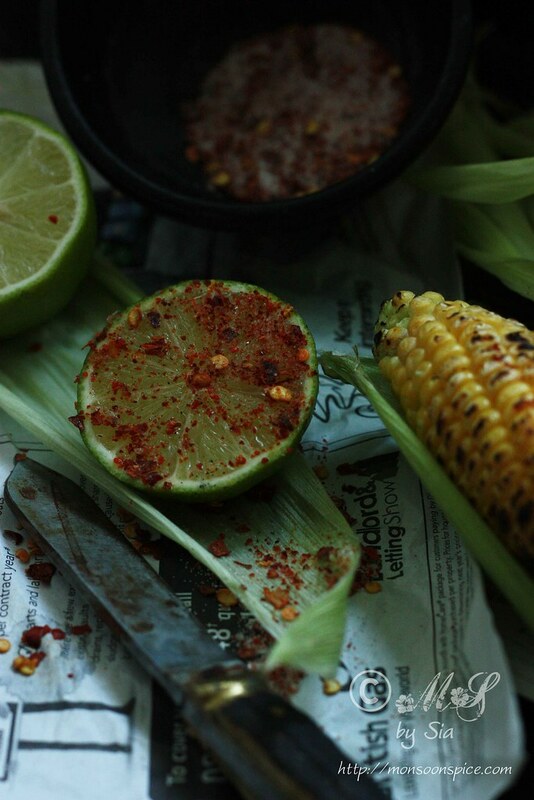 Apply this salt and chilli mixture along the length of the corn squeezing the lime along the way so that the lime juice also covers and enters the grooves of every individual corn kernel. If making it to for little kids, omit the chilli and salt mixture and just use some salted butter instead. 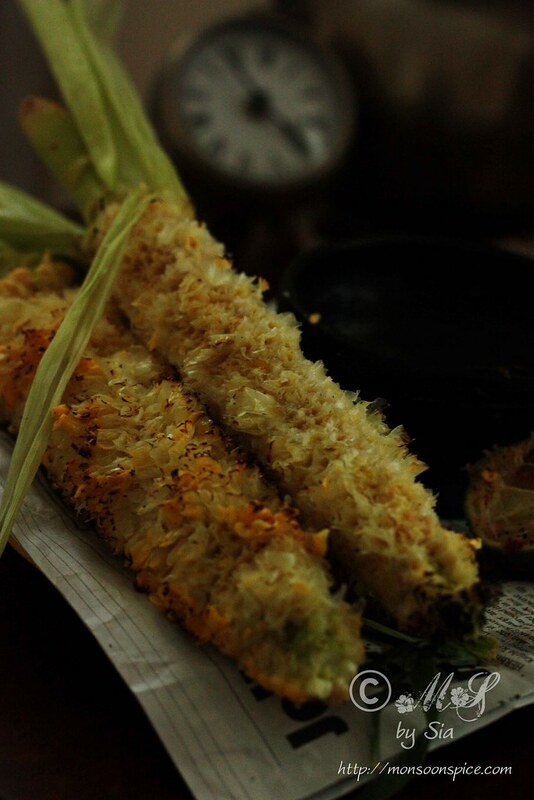 Serve these delicious Bhutta or Indian Styled Roasted Corn on the Cob immediately. Close your eyes and enjoy every single bite of heaven! 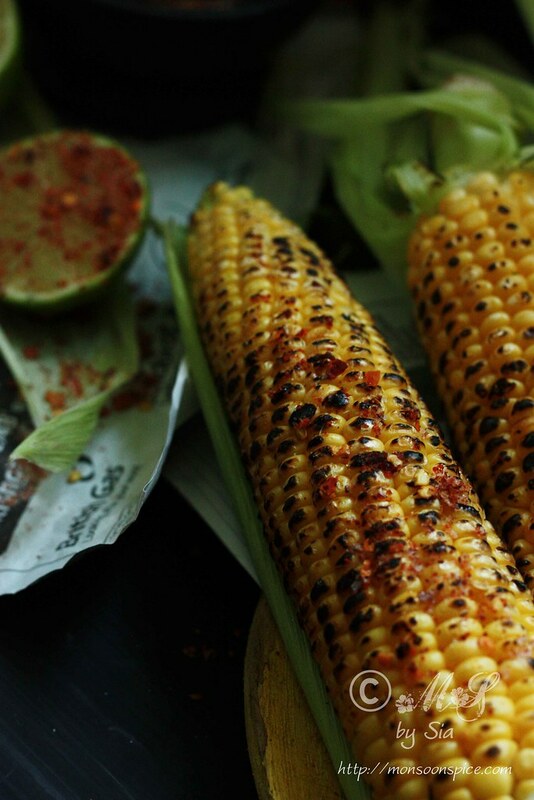 If you are really adventurous and like real spicy foods, then you can use the green chilli chutney to apply on the roasted corn on cob. To make this chutney, grind together few green chillies with sea salt in a mixer grinder or spice grinder or pestle and mortar to somewhat smooth paste. Dip the sliced lime piece in this chutney and rub it along the length of the corn and savour it! Instead of roasting it on the gas hob or stove top, you can grill the corn on the cob in an oven or barbeque or an out door grill. Looks like you are down to either your school days or even college days like I did after reading your post. I still can imagine the way we used to run once we spotted the push cart and the smell of roasted corn on charcoal.There were both the spiced salt and even spicier green chutney I used to always ask for the green chutney on top of the corn; smeared twice and roasted on fire again to properly incorporate the heat. We used to eat the corn feeling the heat in every bite; licking our lips to encourage the heat and ofcourse our eyes used to water! I still cannot forget the taste of it on my lips. I am drooling already! I reinvented the same green chutney in Canada and every summer, that is a crowd pleaser in my bbq party or whenever we go camping. If you have ever tried this green chutney and like it, let me know and I am pleased to share it with you. Bhutta never looked more glamorous Sia! Beautiful photographs. Story just brought back so many memories! Oh, what a lovely story which brought back some memories from back home. This is one of those favorite snacks and is perfect. Love the pictures. 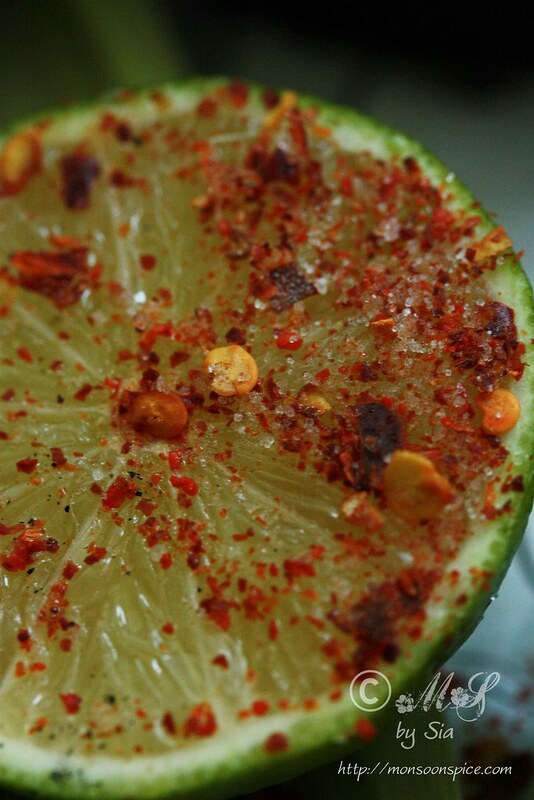 Ok I am officially drooling seeing the picture of the lime and the salt and chilli powder flakes tingy sticking on it! 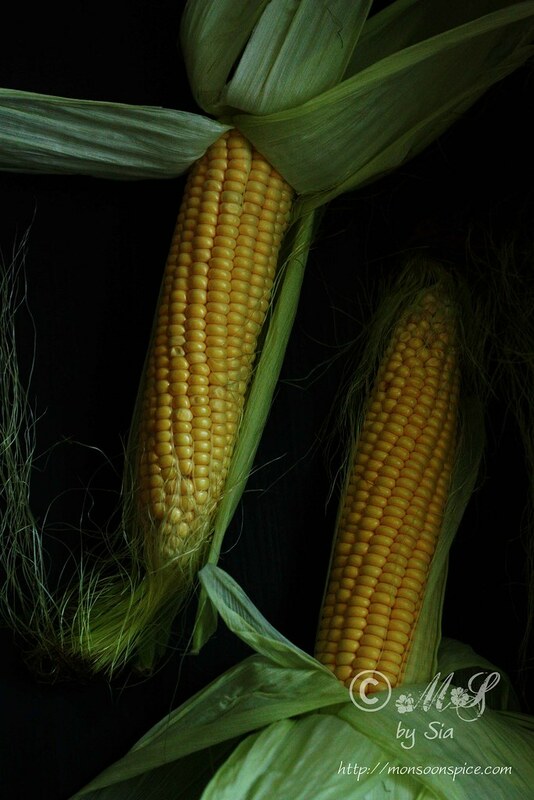 Love indian corn that too this way! For this particular green chutney, you will need 2 cups of coriander leaves (The stalks also are useable, green chillies - about 8-10 (or to taste; if less spicy, reduce it) 2-3 cloves of garlic, lemon juice and salt. Grind all to a fine paste using only lemon juice. That's it! 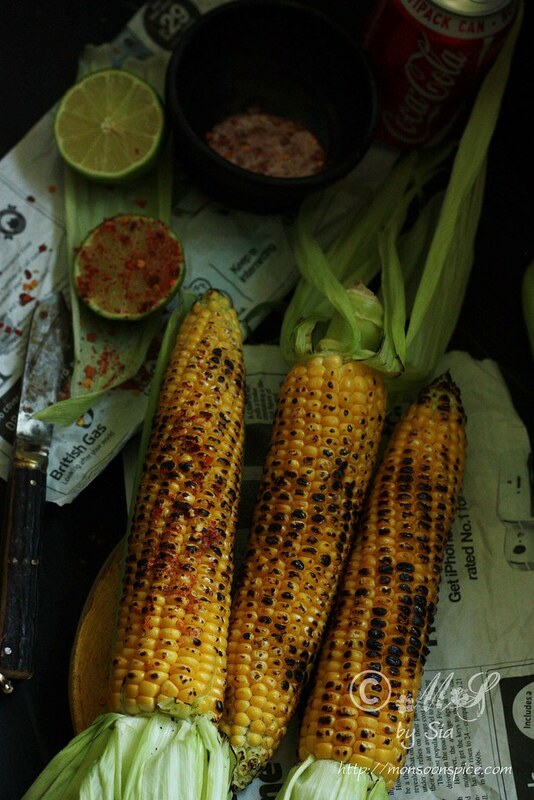 Smear on grilled corn and roast it along with the chutney. This will give a crusty coating on the corn. Then enjoy!! P.S: This chutney goes well with bread as well. Apply on the bread and layer with cucumber, tomatoes, slices of boiled potato and onion. This is very versatile, can be used as dips for pakoras as well, marinate paneer for grilling, on boiled eggs, for making bhelpuris or tomato masala, etc. Try it and I hope you like it. You will know what I commented for your post. @Neela Prasad, thank you for taking time and sharing your recipe. I really appreciate it :) It sounds little like the one we make for chats sans garlic. I will surely try this recipe as it is such a versatile one. Oh Good god.......now i have to either search for a Bhuttawala or get somebody to cook one for me(i sadly own an induction cooktop).